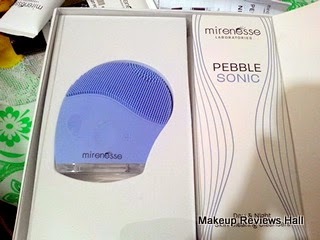 Mirenesse Pebble Sonic is one of those products which I got for review from Mirenesse Fast Fix Solutions . I have already reviewed its Mirenesse Mascara and collagen mask. This Pebble Sonic is a skin clearing device, different from normal cleansing of face since this device actually deep clean your skin removing impurities, stimulates blood circulation through gentle massage resulting in a healthy glowing skin free of fine lines and wrinkles. 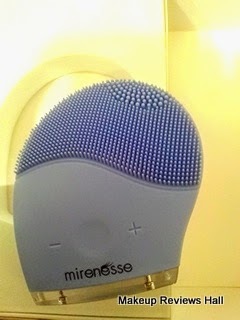 I am a person with sensitive acne prone skin so I have always avoided such facial massage devices. Its very rare I try something like this because such things often make my face red irritated thus aggravating my acne and pimples. But since I was impressed by its collagen mask and fast fix instant lash transplant mascara, I had to give this Mirenesse Pebble Sonic a try. I got two facial cleansers along with the device - Day Purifying Facial Deep Cleanser and Night Anti Aging Cleanser. I have been using it for about a month usually twice or thrice in a week and here is my detailed review on it. What MIRENESSE PEBBLE SONIC CLAIMS? The Facial Cleanser Revolution! Get the complete Pebble Sonic Skin Clearing Facial Collection and enjoy a Happy Skin Glow in just 60 seconds! Revolutionizing the way you cleanse your skin and ideal for all skin types including sensitive, clear congested skin and treat fine lines and open pores in the most effective and gentle way to date! Pebble Sonic Beauty Device- A beautician in the palm of your hand! Pebble Sonic Day Purifying Facial Deep Cleanser 40g- Purifies the skin instantly! Pebble Sonic Night Anti-ageing Facial Deep Cleanser 40g- Lifts and tones the skin instantly! Introducing Zen-Sonic Tap Technology (ZST), 3000 tapping silicone tips at 100 taps per second that sounds pretty powerful! yet ZST technology is gentle enough even on sensitive skin, but works amazingly efficiently to dislodge all impurities, purifying the skin to leave your skin looking amazingly clean, clear, relaxed and fresh. Also Read: Mirenesse Collagen Mask Review. Biotique Papaya Exfoliating Skin Clearing Face Wash.
Release The Inner Happiness In Your Skin Everyday! Super soft silicone tips act gently on all skin types and genders, for a deep cleansing action not possible with normal hand washing. Skin appears more refined, softer and with a natural youthful glow, extremely beneficial to congested skin with fine lines and open pores. The Zen Sonic- Tap massaging sensation stimulates circulation for a healthy glow, day after day skin looks healthier and happier! Super portable, hygienic and goes anywhere, lasts for up to 300 uses with each full charge. Same day good looking guarantee. Like a beautician In the palm of your hand! We recommend cleansing for 1 minute every morning and 1 minute at night. Step 1: Wet your skin, apply your Pebble Sonic Day or Night cleanser to the Pebble Sonic device, wet the device then begin to cleanse your face one area at a a time in an upward and outward motion. Allow approximately 15 seconds for each area cheeks/chin/forehead and neck area. We recommend using the low speed for sensitive areas such as the nose and close to the eye area. Turn of your Pebble Sonic and rinse your skin clean with water, apply your regular skincare! Please note to avoid overuse the device will switch off after 3minutes.We recommend not to use the device for more than 3 minutes at a time, with 1 minute being optimal. Zen-Sonic Tap Technology helps to remove dirt and makeup from your pores, refines the skin by removing dead skin cells and stimulates blood flow through the skin, simulating the effect of a deep facial massage. Ideal for all skin types and genders, for a deep cleansing action not possible with normal hand washing. Extremely beneficial to congested skin with fine lines and open pores. Enjoy a highly sophisticated new generation Sonic Skin Clearing Facial Beauty Device please treat it gently and take a moment to read through the simple instructions to reap the many benefits of this device. The Pebble Sonics multiple brush surfaces allow for cleansing sensitive skin areas, normal skin areas as well as body cleansing. Please use the front side thinner tips to cleanse the face and areas around the nose. The thicker tips on the reverse side may be used to cleanse the chest and body areas. A Modern 3-Day Skin Clearing Revolution! PEBBLE SONIC FEATURES: 100 Vibrations/Second, Upto 300 Beauty Treatments in 1 Charge, 100% Waterproof, 3000 Soft Silicone Tips, USB Rechargeable, 10 year Quality Guarantee. 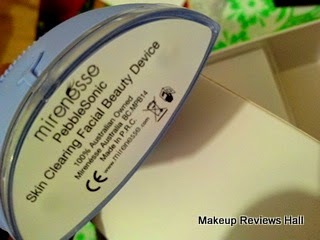 This Mirenesse Pebble Sonic Kit comes in a very sturdy white box with separate section for the device and the facial cleansers. On opening the box, the device looks so beautiful and cute nicely located in the perfect fitting section without any fear of shake or break making this a travel friendly. Adding more to the convenience, one does not need to carry this whole box while traveling, since it comes with a black small travel pouch which makes this pebble sonic device even more easy to carry. This device operates on regular power and gets charged through the charging cable giving with the kit. I like these things very much about this Pebble Sonic Facial Cleansing Kit. They have not just given the products for use but also taken care of it its traveling accessories making it very travel friendly on the go. Normally one can't really think of getting facials or massages while traveling since there are so many problems with it, the top most being how to carry it and how to find a electric point at your convenient place. But this small cute device can be taken easily in travel pouch, works on power and is wireless and portable. I truly think these are some of the best features a company can give complimentary to the product. Now coming to the application of this pebble sonic device. First I tried this with the given facial cleansers. I applied the the face wash on my face and then started this device at a minimum power initially and then increased it slightly since it was too relaxing. I massaged it for about 30 seconds each side moving the device up and down covering all over taking care of eyes. While cleaning only, I felt my skin is getting deeply clean free from all impurities. It was very nice relaxing feel like giving yourself a deep facial cleaning massage for the better exfoliation. I normally exfoliate my skin once or twice a week but with this device it happened almost 3-4 times in a week since I enjoyed doing this and seeing the after effects. After using this my skin felt very clean, refreshed free of all dirt, impurities, no dead dull skin anymore but just refreshing glowing healthy skin. Pebble Sonic Device comes with two facial cleanser, one for day and one for night but I use it along with my other beauty products and face wash. I use it with my clean and clear face wash to give an exfoliation effect along with cleansing. I also use it with my Biotique Makeup Remover since it makes removing of make up so easy with is deep cleaning. All in all I just love this facial cleansing device and this has becomes one of my necessities now. The best part is that it comes with a 10 year warranty, so no fear of it getting damage. Deep cleans skin removing all impurities. Skin looks fresh with a healthy glow. Gives feel of home facial in minutes. Power can be increase or decreased according to the skin type. Exfoliates dull dry looking skin. Very travel friendly and convenient to use. Labels: Mirenesse, Mirenesse Pebble Sonic Device Review, Mirenesse Pebble Sonic Review, Mirenesse Skin Clearing Facial Beauty Device, Pebble Sonic Kit.